We wrote about three hidden Rocky Mount muffler men owned by Original Log Cabin Homes in Rocky Mount. There's actually another muffler man in Rocky Mount that's not technically hidden, but it's darn well close. 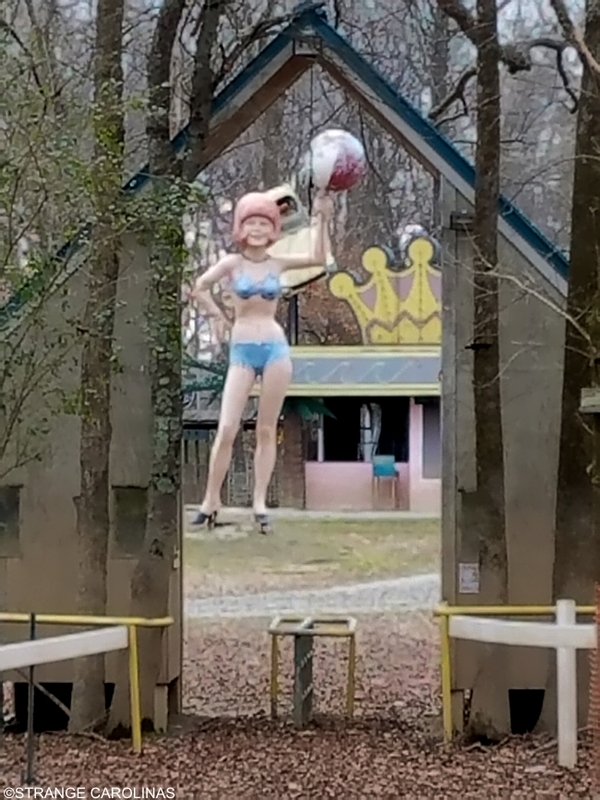 This Uniroyal Gal could previously be found at Mosley's Shady Lake Motel in Rocky Mount. She is now at MNO, or Men's Night Out, in Rocky Mount. You'll notice that she is pretty blurry in this picture. That's because the photo was taken from behind a chain-link fence. A chain-link fence topped with barbed wire. A chain-link fence topped with barbed wire that was chained shut. We don't know what goes on at MNO. It looks to be some sort of entertainment complex made to look like a little town. But from our limited view, we saw a Uniroyal Gal, a car on a stick, and what appeared to be a replica of the Blues Brothers' Bluesmobile, so who knows what other cool stuff can be found there! If you or anyone you know has a connection with MNO and would like to show us around the place, please email us at StrangeCarolinas@gmail.com or call/text us at 336.907.2393. Thanks so much!